Combined SOs /Stenos (Grade-'B'/Grade-'I') Ltd. Department Competitive Examination, 2014 e-Admit Card Download is now available for download. Union Public Service Commission (UPSC) is provided the e-Admit Card for download and the Last date for download of e-Admit Card is 29th December 2014. On receipt of the e‐Admission Certificate the candidate should carefully check all particulars and discrepancies, if any, should be brought to the notice of the Commission immediately. The eAdmission Certificate/official Identity Card must be brought to the Examination Hall in all the sessions. The candidate should exercise due care for safe custody of the e‐Admission Certificate and ensure against any misuse for which the candidate himself/herself will be solely responsible. Due to technical reasons, sometimes the name of the candidate(s) are abbreviated for printing on the e‐Admission Certificate. For this no communication need to be sent to the UPSC. There will be penalty (negative marking) for wrong answers marked by a candidate in the objective type Question papers. The candidates are therefore, advised to go through the notification of the examination in this regard. The Stenography Test will be conducted at Delhi Centre only. The candidate’s Roll Number for appearing in the Stenography Test is the same as given in the admit card. The candidate should report at their Centre at 08.30 A.M for English Stenography and at 01.30 P.M for Hindi Stenography Test. The Entry at the Main Gate will be closed at 09.00 A.M for English Stenogrpahy and at 02.00 P.M for Hindi Stenography Test. NOTE:- PLEASE VISIT UPSC WEBSITE UPSC.GOV.IN FOR DETAILED INSTRUCTIONS AND TIMELINE. 3. 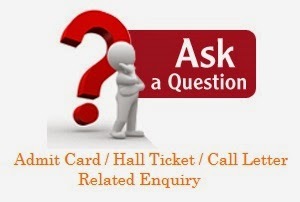 Bring this e-Admit Card in each session to secure admission to Examination Hall. e-Admit Card may be preserved till the declaration of written result. 8. Please Read the “Rules for the Examination" on the "Poster" containing instructions displayed outside the Examination Hall. 11. Candidates are advised to bring Black Ball Point Pen for objective type Paper's to the Examination Hall.